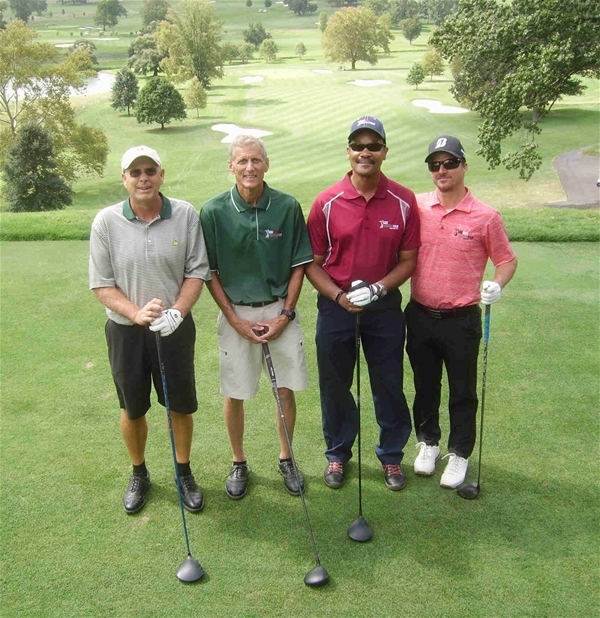 Dave Neder (PM), Don Sivertsen (PM), Ross Riviere (MNY) and Jeremy DeWit (MNY) on the 1st tee at MG&CC. Manufacturers Golf & Country Club hosted the GOLFWEEK Amateur Tour (Philly Metro & Metro New York) on August 28th, 2017. The golf course, a Toomey-Flynn design from 1925, winds through creeks and rolling meadows near Ft. Washington, PA. This great classic course challenged the field of 96 tour members on a partly sunny and breezy summer afternoon. Par for the day was 72 (35-37), with the upper 18th green in play as a Par 5 hole. In the Championship Flight, new Philly Metro member Stephen Scott (78, 38-40) broke through for his first victory on tour by four-strokes over Metro New York members Joe Arnold, Jr. (82, 40-42) and Mike Aversano (82, 39-43). The CHAMP Flight played BLACK Tees from “the tips” at 6,834 yards. The A Flight went to a playoff between Philly Metro member George Steinmetz (77, 38-39) and Metro New York member Scott Vanisko (77, 37-40). Steinmetz claimed the victory with a “birdie” 3 on the Par 4 1st hole. Metro New York member Jose Rios (79, 38-41) was two-strokes back in 3rd place, and Philly Metro member Josh Numbers (80, 41-39) was another stroke back and took 4th. The A Flight played BLUE Tees from 6,567 yards. In the B Flight, Metro New York member Alan Navarro (83, 41-42) claimed the title by one-stroke over Metro New York Director Tom Steinmann (84, 41-43). Five players were tied at 86: Philly Metro members Wallace Wade (42-44), Greg Ricker (42-44), Frank Giordano (40-46), Richard Paskman (36-50) and Metro New York member Ryan Dominici (38-48). On a match-of-cards, Wade took 3rd place and Ricker took 4th. The B Flight played GOLD Tees from 6,300 yards. Our next tournament is being held at Wildwood Golf & Country Club) on Saturday September 9th 2017 with tee times starting at 12:00 PM. We are looking forward to our “down the shore” golf experience!